Projection is the psychological term for imagining that others possess faults which are actually your own. Case in point: those liberal predictions that after Donald Trump lost the election, violent Trump supporters would attack innocent people, especially members of minority groups. Visions of storm troopers danced in their heads. Vast mobs of white-hooded Ku Klux Klanners would terrify the countryside. Brownshirts and Blackshirts would infest the city streets. Something like that is happening now — but the violence is coming from leftists, not Trumpists. Take the University of California, Berkeley, [long pause] please. That’s where a speech to the Young Republicans by rightist provocateur Milo Yiannopoulos was shut down by a screaming mob on February 1, as this eyewitness account from Power Line’s Steven Hayward records. 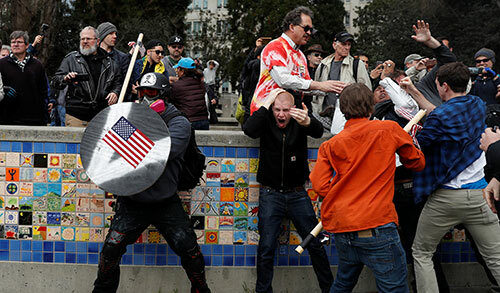 Not only was the speech shut down, but gangs of ski-masked and bandana-wearing protesters roamed the streets just off campus with sledgehammers, smashing ATM machines. In one instance, Hayward reports, a 62-year-old Republican who voted for Hillary Clinton held up a sign reading “1st Amendment Protects All Speech” and, on the obverse side, “Even Milo’s” was punched in the nose and dropped to the ground. Read the rest from Michael Barone HERE.